And your simple explanation serves to show that you do not really understand the issue. The S100fs does not have a 28-400 zoom lens. 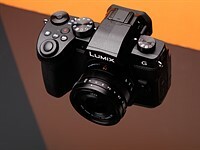 It has a 7-100 zoom lens and the 4 x crop factor associated with the small sensor gives the 35mm equivalent. That same crop factor affects the depth of field calculations. Crop factors DO concern anyone interested in depth of field, regardless of the camera.